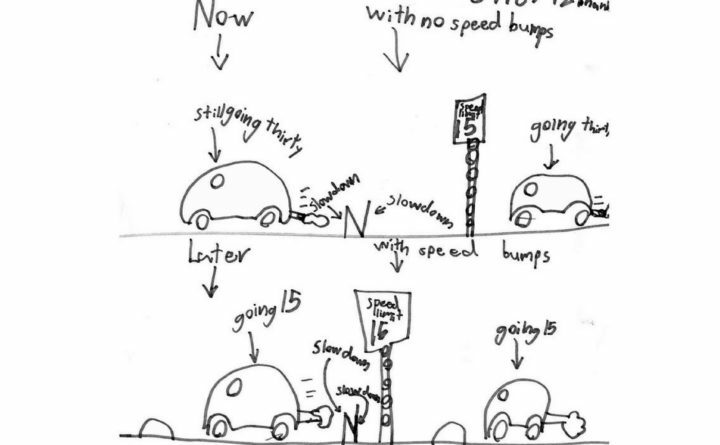 A drawing by Max Blake, 8, of Newcastle, advocates for speed bumps. The Newcastle Board of Selectmen agreed to ask the Maine Department of Transportation to review the speed limit on some town roads. The Newcastle Board of Selectmen will ask the Maine Department of Transportation to evaluate the speed limits on six town roads after receiving a letter from 8-year-old Max Blake about speeding on Timber Lane. The selectmen discussed the letter with Max during their meeting Monday, June 11. In his letter, Blake said that while the speed limit on Timber Lane is 15 mph, vehicles go much faster, between 30 and 50 mph. “We put out a slow down sine (sic) and they still won’t slow down!” Blake wrote. Blake finished the letter with two drawings, one of the street without speed bumps and a car speeding by the 30 mph sign, and the other with a speeding car slowing down for a speed bump. Selectman Ben Frey said that while speed bumps can be effective, they can also be noisy. The selectmen decided to ask MDOT to review the speed limits on Timber Lane, as well as Academy Hill Road, Cochrane Road, Lewis Hill Road, Lynch Road, and Stonebridge Circle. The next selectmen’s meeting will take place at the town office at 6 p.m., Monday, June 25.